Are cities democratic if the processes that shape them are not? 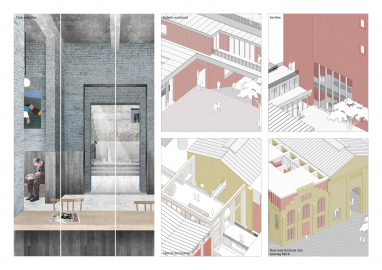 The project redesigns processes of urbanism in Tbilisi, through an architecture that promotes city making as a collective, conflictual endeavour. 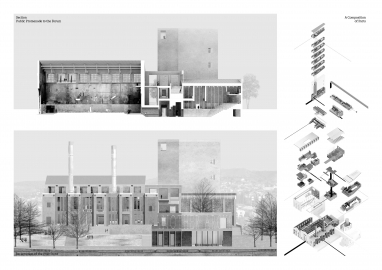 A disused power station is transformed into an active organisation where the evolving project of the city can be revealed and reimagined. Georgia’s young democracy has been consistently undermined by many economic, political and territorial pressures. This has suppressed citizen engagement, and the potential for a democratic urbanism has been negated by the generalising tendencies of unrestricted urbanisation. The city of Tbilisi is in a state of paralysis, disrupted by over-densification, endless traffic and the degradation of public and green space. This had led to a polarity of responses; the masterplanning of the state against a number of activists reacting to isolated urban issues. There may be a high level of antagonism within this field of actors, but there is no space that enables its productive - or agonistic - potential. 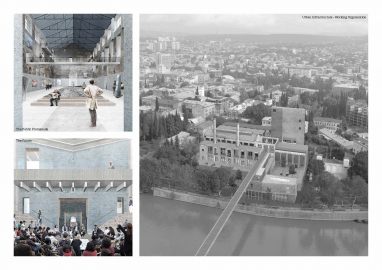 The project challenges the current processes of urban governance in Tbilisi by providing the infrastructure for a strategic and conflictual urbanism to evolve. The proposed organisation aims to bring together a multiplicity of voices into a place of negotiation, with knowledge, research, discussion, debate and presentation emerging as its primary foundations. 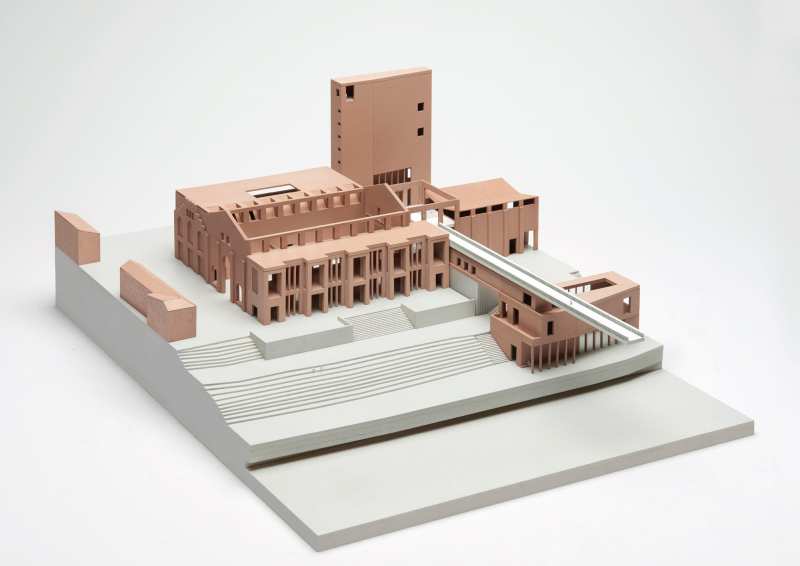 The building facilitates the curation of ideas and knowledge for the city with workspaces for small scale urban actors, supported by a city archive and various civic functions. 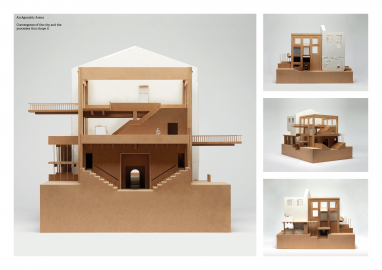 A range of discursive spaces allow these issues to be negotiated, debated and then acted upon, and several exhibition and gallery spaces present this to a wider public. By connecting a diverse network of stakeholders the project aims to democratise the act of city making, and in doing so impact decisions in the interest of both the city and its citizens. Rather than suppressing conflict, this agonistic arena allows differences to be confronted and channelled into productive outcomes. The project lies in the very centre of Tbilisi, regenerating a disused power station and bridging a gentle curve in the Kura river. The organisation is framed and directed by architecture, and can be understood as a composition of parts, the ensemble of which becomes a figure of the city at large by representing some its intrinsic conflict and variation. A new pedestrian bridge connects the contentious Rose Revolution Square directly with the disused power station, transforming its main hall into a public promenade which circulates a scale model of the city. The project also marks a symbolic reclamation of the river front, and this gradient of public spaces defines the project as a piece of urban infrastructure as much as a working organisation. 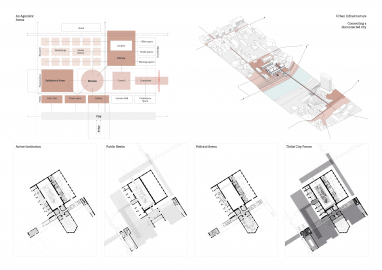 As a complex architectural composition, embedded within a holistic urban strategy, the project aims to unite the building with its object of concern; the city. 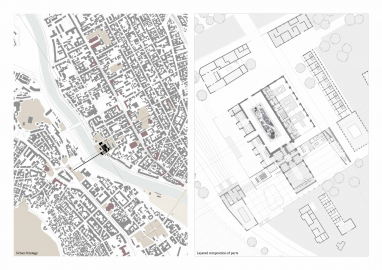 The Agonistic City is a reinterpretation of civic architecture - by curating agonistic urban processes it enables the reimagining of the project of the city.